Hi friends! So this past month, I ran out of space on my WordPress.com blog account. I know. BIG surprise. With all of the pictures I upload it wasn’t a shock at all haha…but then I had to figure out what to do next…because increasing space on WordPress is pretty pricey…so I decided to go with BlueHost.com to host my blog site. I’ve been moving everything over and trying to get things up and running again, so I finally feel like it’s somewhat presentable haha. If you have been following my site through email, I’m pretty sure you will have to resubscribe on the new site address. Thank you for your interest and support and thank you for stopping by! I was thinking the other day how long it had been since I started writing here in this space, so I went back and found my first post haha! Of course it was mainly about Jacey, because we didn’t have kids yet…so just in case you’re interested! It’s been about 7 years! You can also follow my posts by email if you click the link in the right column. I’m sporadic with posting so I thought that might be helpful! So what have we been up to this summer??!! This summer we got some new patio furniture! Our patio here is a little bigger than our last, so we were able to get a table (from Wayfair) to eat at and have a little space to lounge (from Target)! Our little Jude Jude LOVES building things and “helping” Jacob when he puts things together. Of course we’re still having LOTS of baby snuggles! I don’t know what I would do without my Solly baby wrap, this is my number one must have and its so good for them and you and those crazy postpartum times! Jenson still takes his first nap in my wrap while I make and eat breakfast, and he will snooze in it while we are out usually too. It cuts down on his crying SO much, just helps him feel more secure…it evens helps them with their digestion (saved me with his reflux!) and regulating their heart and other systems! It’s helped so much though to free my hands up to cook for us and play with the big boys. All of my boys just didn’t nap well alone until they were a little older, no matter how many times I tried laying them down, so this has helped out so much in that area. We have started seeing so many happy smiles from this little guy, and reflux is improving. Sleep has gotten a little better some nights, but my kids just aren’t super consistent in that area! In may we celebrated Jude’s 3rd birthday! He was so excited to have a little airplane party with our family. I just love that top picture of Jacob and his brothers. My parents came in the day before and celebrated Jude’s actual birthday with us. 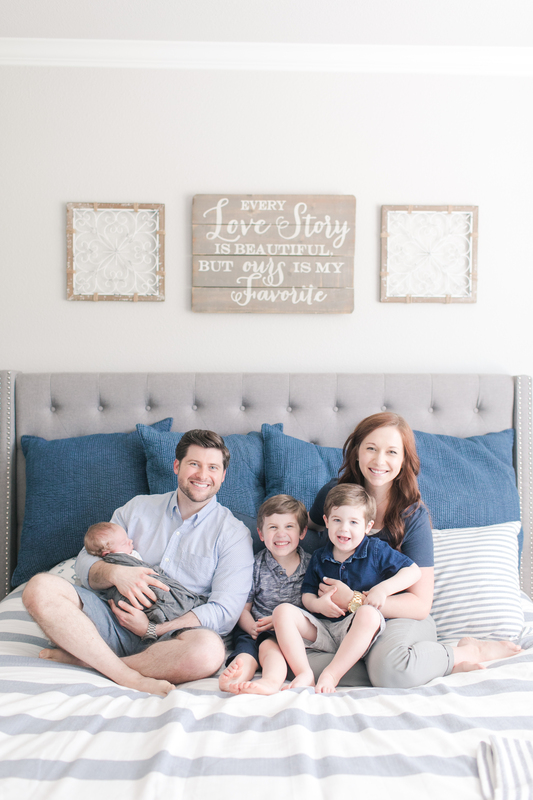 We celebrated Mother’s Day and our first trip to church with JJ as a family of five! Jackson had his last day of school! He had a jump day/party day and then a program day. And friends, I cannot tell you how proud I was of him…the first program of the year at Thanksgiving he was like, “No thanks, I will NOT be getting on that stage and singing turkey songs.” He didn’t even want to sit with his class. But by the end of the year it was a totally different story. He stood on stage the whole time and sang all of the songs. We loved his teacher so much this year, she was a joy and just did so much for his self confidence. I just love these brothers so very much… I’ve said it before how I had hoped Jenson would be a girl, but since he hit the scene I haven’t had another thought about wishing I had a daughter. These boys are beautiful and sweet, they are exactly what I want and I would chose them over and over again. We feel so complete here now, I don’t feel like I am missing out on anything not having a girl, and I am in love with being a boy mom. I know it will only get sweeter as they get older. The top right picture is the boys having a “dinosaur museum” hehe… they even made tickets! We celebrated Memorial Day by going to a park and then grilling out on the patio! We celebrated Fathers day, checked out the mall here…which is kind of lame haha! and enjoyed time at home together. We’ve had some sweet visits from friends! One of my best friends, Miranda and her daughter came to visit, and then two of my old roommates from A&M drove in with their families for the day. It was so fun catching up with everyone! We went to our first VBS here at Twin City church of Christ! The boys loved it! They had a great time singing the songs, doing activities with their classes and watching the reinactments from the high school kids. The last day we had a double rainbow that evening across our neighborhood! Just thought that was so special, they had begun the week talking about Noah and ended the week seeing God’s promise again. More celebrating! My birthday in July and my mom’s back at the end of June. Fourth of July fun! We spent the morning swimming with some of our dearest friends and grilled yummy burgers for lunch! We’ve been trying to spend lots of time outside! It’s hard though because it is just BLAZING HOT most days, but we have enjoyed the trails in the nature park around our house and riding/walking the paths through the trees at the front of our neighborhood. We have seen this mama deer and her baby multiple times now and its just the sweetest thing! Jacob and I celebrated 11 years being married! ELEVEN! HOW DID THAT HAPPEN? I still feel like I’m 23 most days hah! We had sweet friends here who offered to watch the big boys for us and we went out for lunch. We made our first trip to Houston this summer! Jenson HATES the car, I’m talking “bloody murder makes the mama cry” kind of screaming so that is one reason why we haven’t gone too far with the little nugget yet. Jacob’s family got together to celebrate his parent’s 40th wedding anniversary and them both turning 60 this year. I told you, all we do is celebrate during the summer haha! We also enjoyed meeting our newest baby cousin, Lincoln! We also made our first trip to Vidor and Jenson got to meet my aunt, and also got to see my cousin’s wife and kiddos! It has been about a year since we had been back to Vidor, my poor parents still aren’t back in their house since Hurricane Harvey. Hopefully it will be soon. I have missed seeing those sweet sweet people there, it was so good to see their kind faces. We also took Jenson to daddy’s office for the first time and have lunch. He made all the ladies there swoon haha. These are just because. 🙂 Love this little munchkin! He’s gotten so strong lately! We have just loved watching him grow…you know by that third kid, you just realize how much “baby stuff” is just a bunch of passing phases and those hard ones will go by…you don’t stress as much about it all and can just enjoy them more I feel like. If you’re on the fence about a third like we were, just do it. It’s crazy busy/nonstop/hard/exhausting but it us so worth it! Whew! This post was exhausting hah! Hopefully the fall will settle down a bit! Hope you enjoyed seeing what we’ve been up to lately! Here are some of my other Catching up with the Campbells posts! Catching Up With the Campbells!